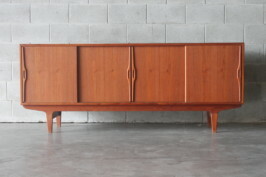 A beautiful sideboard by Skovby it has simple clean lines allowing it to work in contemporary interiors or work spaces. Internally is adjustable shelving and finished off with black feet for the perfect contrast. Would also work well as an entertainment unit for the big flat screen tv.